We might think that roofs are invincible, but they really aren’t. Even if they are designed to withstand the harshest weather conditions, they can sometimes be of no match to the wrath of Mother Nature. In fact, weather-related causes are among the most common causes of roof damage, and will affect how long your roof can last. A particularly nasty storm, intense snows, extreme temperatures, or strong gusts of wind can badly affect it. Imagine suddenly seeing your roof flying off and everyone inside the house getting drenched in the middle of a hurricane. Or your roof suddenly caving in because of too much snow. Or your roof seems intact but in certain spots, water won’t stop dripping whenever it rains. Sounds crazy, right? But, these all happen! What Does Wind Damage Look Like on a Roof? Will Homeowners Insurance Cover Wind Damage? Wind is one of the most common weather-related cause of a damaged roof. In fact, it doesn’t need to be together with other weather conditions; wind alone can wreak havoc on your roof, such as having wind damaged shingles. Unless they are securely installed, asphalt shingles, and even wooden shingles, are no match for the strength of the wind. In fact, don’t be surprised to see your shingles blown off during a very windy day. And if you invested a lot on having architectural shingles installed on your roof, this is something you don’t want to experience. Spotting wind damage on a roof is fairly easy, but only if you know where to start looking. At times, it can be visible if you are looking up from the ground. Focus on the corners of your roof, since these are the most vulnerable when it comes to wind damage. But more often than not, checking your roof for wind damage will require climbing up to your roof. Since this is a tricky and quite risky task, especially if the thought of standing on high places makes your knees weak, it is best to get a roofer to do it for you. Any signs of roof leaks – this is something you can do yourself, since you can just go to your attic or crawl space and check if there are any leaks present. If not, look for discolorations and water marks. Roof damage that causes leaks are hard to spot, unless the cracks or holes on the roof are big enough. That’s why actually seeing signs of leaks are your best bet to discover them. Debris on the gutter – it’s normal for shingles, particularly asphalt shingles, to lose granules over time. What’s not normal is to lose a lot after a windy day. To check if this happened to your roof, your gutters will show you that. These granules and other debris will often settle on the gutters, so check whether or not there’s a significant amount of shingle granules present. If so, your roof needs to be checked out. Lost shingles – earlier, we mentioned that strong winds can cause your shingles to be blown off. 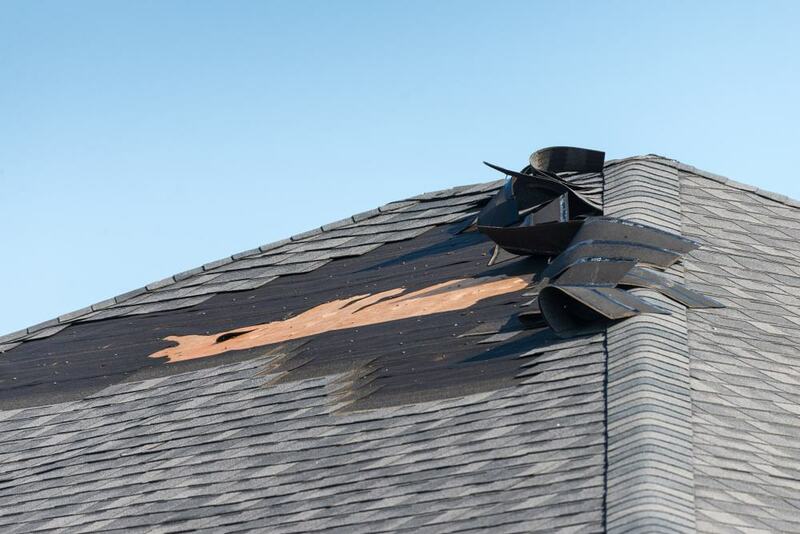 Wind is the most likely culprit for missing shingles, together with intense rainfall and branches that have fallen off. Shingles that have been lifted – this type of damage is particularly tricky, as it is nearly impossible to see from the ground; someone needs to climb up and inspect the shingles for signs of unevenness. That is, a shingle or two may look like it is higher than the rest. Lifted shingles mean that the nails holding them in place have loosened up, and the sealant that covers the seams between shingles have been broken apart. When this happens, roof leaks are likely to happen soon. Shingles that have curled up – roofs have so-called stress points, namely the corners, edges, ridge, and in the chimney area, among others. These points are susceptible to wind damage, and shingles found on these sections can curl up when encountering strong gusts of wind. Like in the case of lost shingles, wind damaged shingles that show signs of curling can also result in roof leaks. Damaged Chimney Flashing – having the flashing of your chimney split or completely missing means that it has suffered wind damage. If your roof shows any of these signs, it is vital to get a roofer to completely assess the damage. Have the necessary repairs done as soon as you can to prevent further roof issues, especially leaking, which will affect the rest of your home. One of the most vulnerable spots on the roof when wind is involved is the edges, particularly the corners. Although the wind pressure that your roof will receive varies depending on the section, it is always the corners that experience the highest amount of it. Have you ever seen a stack of paper being blown away? Did you notice that they always get lifted up from the corners? This is what exactly happens to a roof when dealing with strong winds. Even the NRCA, or the National Roofing Contractors Association, has confirmed that a lot of roof wind damage will begin at those areas. You will not immediately see its effect, since the wind will only gradually lift up roofing materials that have become loose. Over time, the lifted-up section of your roof will become larger whenever it encounters strong winds. And when this is repeatedly experience, the loose section may start peeling off from your roof decking, exposing not just the decking but also other components of your roof. Think of it as lifting paper from one corner. That’s what happens to the corner of your roof. Once this occurs, all sorts of roof issues will follow, starting with water damage and leaks. If this is left unresolved, you will have to get a new roof sooner than you think. Fortunately, this is an avoidable scenario. You just need to make sure that the edges of your roof, especially the corners, are durable and in perfect condition to survive high wind pressure. You can do this through regular roof maintenance. Whenever there’s an announcement of an upcoming storm, it’s normal for us to make the necessary precautions. We go grocery shopping in case we can’t go out for days due to floods, we stock up on candles and batteries for flashlights, we make necessary repairs to prevent rainwater from coming in, things like that. During the storm, we normally just wait it out. We look for ways to pass the time until the storm is over, hoping that the damage not just to our homes but also to our neighborhoods won’t be that bad. But after the storm? That’s another story. Unless you see any visible damage anywhere that warrants an urgent repair, you’re likely to just focus on cleaning up and won’t really bother to thoroughly inspect your home. What if we tell you that waiting for any problem to manifest itself after a storm is such a bad idea? Walk around the perimeter of your home and look for any obvious signs of damage anywhere. It’s normal to see fallen tree branches and debris, but make sure to check if they have hit any part of your home and caused damage. Any outdoor furniture and appliances may have also been beat-up, so include them in your inspection. And if you have fences, see if there are any broken sections. If you have a patio, deck, or any similar outdoor areas, take a closer look if they sustained any damage, especially after a hailstorm. Check for cracks on the wooden flooring, as well as for any parts that got loose, stemming from potential water damage also. Check your windows for signs of cracks, shattered glass, smashed frames, and other damage. Also inspect the condition of your weatherstripping if it needs replacing. Your gutters, including the downspouts, may have also been damaged by the storm, so check if they have become loose or misaligned. You should see check if there are debris stuck inside, because these can block the flow of water when not removed and cause leaks. Other accessories are also at risk of being separated from your roof during a storm, such as the roof flashing. Having your shingles blown off are also a common occurrence, so check for any missing ones. On the walls and foundations of your home, find cracks, bulges, and separating parts. If these are present, this means the structural integrity of your home has been compromised and it is unsafe to remain inside. If you have a car left outside during the storm, check to see if it has been damaged by debris or water. Inspect your home’s siding for signs of dents, cracks, splits, or discoloration. They may even break apart if the adhesive or nails holding them in place are not strong enough. 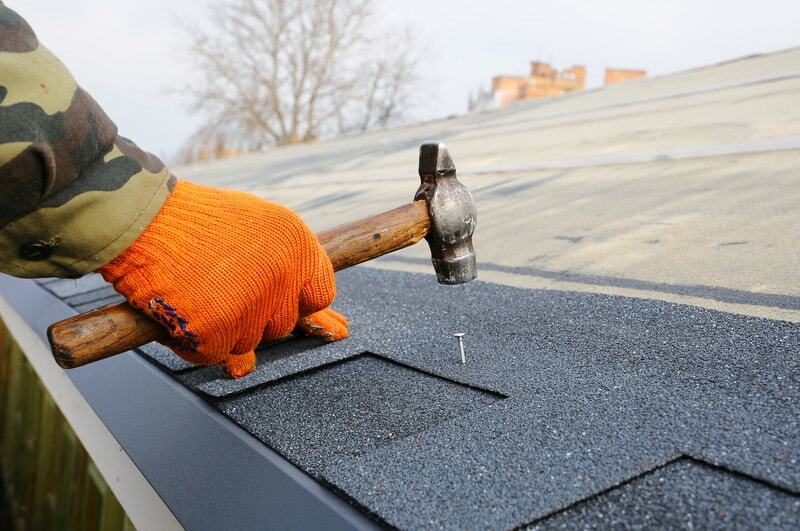 See if there is any damage done on your roof by getting a roofer to do it for you. It is unsafe to go up to the roof after a storm because it is slippery and your roof may have become weak, so this task needs to be done only by professionals. Find any signs of leaks or water damage inside. Water may seep through any opening in your home that you have yet to notice. Go up to your attic or crawlspace with your flashlight and check if any section shows water damage or leaks coming from your roof. You can also use your flashlight to see if there are any punctures or cracks present on your roof. Inspect your ceiling for signs of a ceiling leak or water dripping down from your light fixtures. If there is, never touch your ceiling and immediately call an electrician. People will also commonly experience water dripping from the exhaust fan. Check your basement if it got flooded. Even if there is no flooding in your area, rainwater may have entered your basement and settled there. If so, do not attempt to go in unless you have cut off all power in your home to prevent electrocution. Power lines may have also been affected, so be careful when doing your inspection. If you see any downed lines, avoid going near them and immediately call the local officials to report it. You can only do so much with inspecting your home, since you can only check for the obvious signs of damage. It’s always a good idea to get professional, licensed contractors to thoroughly check out your entire home, from the top of the roof down to your basement, if you feel that it has sustained some damage. There may be other issues you failed to notice that your contractor will know. Check with your insurance company about their policies regarding damage after a storm. They might require you to get your home inspected only by contractors affiliated with them. If not, inform your chosen contractor about your homeowners insurance so that he or she can take measures to avoid voiding your policy, in case repairs are needed. You’ve spent a lot on your roof, hoping it would last you a long time. The money you forked out on your architectural shingles required you to work overtime for several weeks. Or if you’ve inherited your home that comes with wooden shingles, you already know that the cost of their regular upkeep is no joke. That’s why storms and very strong winds are a nightmare for homeowners. We know that there’s a huge chance of our homes getting damaged because of it, even if we don’t want it to happen. So, we’re lucky if we just have to clean up right after a storm. But sometimes, luck isn’t on our side and we discover issues in our homes after a storm. Leaks, cracks, broken fences, shattered glass… these are common problems homeowners face afterwards. What many don’t want to happen is getting a damaged roof. Roof issues are not as easy to solve as water leaks, peeling paint, or even shattered windows. Since it is the highest area in your home, safety will always be an issue. This is why even if there are so many video tutorials and detailed instructions about doing DIY work on the roof, it is not recommended. One wrong misstep while up on your roof can already land you in the hospital, or worse. This is why at the first sign of damage to your roof, you should call a roofer immediately to have it assessed; shingles blown off that you discovered lying on the ground may not be the only issue your roof is facing. If a roofer doesn’t conduct a thorough inspection, you might never know that you also have missing, lifting, or wind damaged shingles, cracks, and all kinds of debris from the storm until you suddenly experience leaks all over your home in the middle of a rainfall. Getting your roof seen to is an urgent matter. Even if you might have to pay huge amounts to get your roof fixed, or worse, replaced, this is a small amount compared to doing it later. You’ll likely have to pay to fix not just your roofing issues but also any other problems that came up that are caused by a faulty roof, like water damage and leaks. You also need to call your homeowners insurance provider to check whether or not roof wind damage is part of your policy and what you need to do to claim insurance. This should never be postponed because some insurance providers are strict with application and claiming periods – they impose penalties for late filing. Depending on your provider, they may also send someone to personally do an inspection, or they may just rely on your submitted documents. You should also inquire if you can hire any roofer, or if you can only work with their accredited roofers, as well as any restrictions on the roof repair that may void your claim. You must inform your roofer about the scope of your insurance policy to avoid accidentally voiding your claim once work on your roof starts. Since insurance companies require documentation, it is good practice to get your roofer to take photos of all the damage present. Normally, roofers will do this, as well as provide documentation for your claim, for free. Reimbursement is likely, so make sure to keep all of your receipts that are connected to your roof repair, even the ones before you hired your roofer to do the job. Most insurance companies also cover these costs, but it will still depend on your policy and your submitted documents. You should also check the warranties of your roofing materials and installation if they are still valid. The wind may not be the sole cause of damage on your roof; it may also be because of faulty materials or installation. If still valid, you should also claim them to help you save on costs, especially if your policy will not be able to cover everything. We all want to cut costs when getting home repairs done, as they can get pretty expensive. You’re lucky if it will only set you back by a few hundred dollars. Roofs are no different. In fact, they consistently rank as one of the most expensive home repairs, starting from $150 to as much as $5000. And if you have a pretty fancy roof with equally fancy accessories expect the costs to be higher. And if you’re looking at a roof replacement already, that’s going to hurt your budget a lot. But, what if you can lower the costs of getting your wind damaged roof repaired? Your homeowners insurance is the key! The good news is, most insurance policies cover wind damage to a roof. But the bad news is, there are a lot of factors involved when it comes to claims, and this can affect the amount that your insurance provider will shoulder once you get your roof repaired. Age of your roof – the younger your roof is, the more likely you may be compensated in full for your roof repair. Older roofs will depreciate in value, and this means less reimbursement or payment from your insurance provider. Your location – if you live in an area prone to extreme weather disturbances, this can negatively affect your insurance claim. Roofing materials used – if you have the most expensive kind of wooden shingles, or top of the line architectural shingles, your claim might be compromised. Your insurance provider may not fully pay for the repairs on your roof, especially if the total cost is too high. Before filing a claim, check your policy if wind damage is indeed part of your coverage. In particular, read the ‘dwelling coverage’ of your homeowners insurance. This lists down what kind of natural causes are covered by your policy. Insurance deductibles will often be required before your provider will start paying for the repairs, and even reimbursing you for the related expenses. The amount that your insurance provider can shoulder will also depend on your policy’s coverage limit. So if your roofer gives you a quotation of $10,000 but your coverage limit is only up to $8,000, you’ll have to pay for the rest of the repairs out of your own pocket. If you want to find out more about the basics of homeowners insurance, you should definitely check out this article. If you’ve read your insurance policy from front to back and you’re 100% sure that your policy covers wind damage on your roof, it’s now time for you to file an insurance claim to get your roof repaired. Some homeowners underestimate this step, thinking that they’ll just have to file the paperwork and they will be immediately compensated for the repairs. There are also those who decide to just go ahead and get the repair on the roof done and file their claims later on. If this is what you’re planning to do, stop! Even if this is possible, you’re also at risk of voiding your insurance coverage altogether, especially if your provider discovers that the method of repairing your roof does not follow their policies. Insurance providers are known to be very strict when it comes to processing claims. Every single paperwork should be filed correctly and properly documented, and the entire repair work should be done according to their standards and policies. If not, there’s a huge chance that your claims will be rejected. Or worse, they may assert that you have violated their policies and they have the right to terminate your insurance. This is a nightmare scenario for all homeowners, who rely on their homeowners insurance to take care of those costly repairs. Unfortunately, they’ll have to shoulder the costs of getting their roof repaired in these scenarios. This is something everyone should avoid. And to do that, it starts with filing your insurance claim. And because of the chances of being declined, many find it such a daunting and nerve-wracking task. But don’t worry, it’s really not as hard as it looks. Even if you are familiar with your policy, it’s better to get firsthand information from someone with the company to know the details of your coverage and how you can file your claim, including their latest policies about it. You can also get a rough estimate of how much your provider will shoulder for your roof repair, even before filing your claim. They’ll ask questions about your roofing, as well as the presence of those factors we mentioned earlier. If you can, you can contact your insurance agent or advisor first and inform him or her that you will be filing an insurance claim. This can be helpful because your advisor may even help you out in filing and make the entire process easier. He or she can also clarify any questions you might have about your policy. Your insurance provider may also send someone to your home to assess the total damage done on your roof. This is why it is vital that you keep everything as it is until the inspection is done. If not, your claim can be drastically affected. But keep in mind your duty as a homeowner and check if there is a ‘duty to mitigate damages’ clause in your policy. Remember that the earlier you file your claim, the better chances for its approval. But of course, you still need to back it up with complete documents. Claims will rely heavily on all the documents and other forms of evidence you submit; it’s not enough that someone from their end personally saw the damage on your roof due to strong winds. And, we’re not just talking about filling out those seemingly never-ending forms. Did you know that having ‘before’ photos of your roof is a major factor that will affect your claim? This will help prove that your roof was in good condition before sustaining wind damage, strengthening your case. It’s good practice to take photos of your home for insurance purposes before it gets damaged in any way, as this will help make your filing for your insurance claim later on much smoother. Again, you should keep all of the related receipts once you get any work done on your roof, especially if you want to get reimbursed. Ask your roofer to make written reports that highlight the extent of the wind damage and his or her quote for the repairs. Itemized list of materials to be used is also important. While most roofers are qualified to take on the challenge of repairing your roof, not all of them are well-versed when it comes to insurance matters. Sadly, a few homeowners realize it too late when they are given the news that their insurance claim is rejected because of a misstep done by their roofer. If you are claiming insurance, it is best to get a roofer knowledgeable about general insurance policies involving roofs to avoid such a situation. He or she can also help in making your filing a lot easier, especially when it comes to providing the needed documentation. If you’re not sure where to look for one, insurance providers likely have accredited contractors you can consult. If your claim gets denied, it doesn’t mean you can no longer appeal their decision. Talk to your insurance agent or advisor about the next steps you can possibly take and refile your insurance claim if it is still possible. One of the rare upsides after a storm is that when you need a contractor, they will come rushing to potential clients like you. These contractors know that at this period, competition will be tough because a lot of homes will sustain some damage that will require their services. If you need the services of a contractor at this time, it might be quite a pain for you to choose one. With so many options available, you’ll likely feel overwhelmed and may just pick one at random. What if we tell you that our service will help you in your decision-making, without much effort in your part? After all, what you’re going to do is just fill out the form, sit back, and wait to hear from as much as four competing contractors… for free! Once the contractors in your area contact you, they’ll also include their quotes for the roofing job. And since they know they’re competing with other contractors, they’ll all give you the fairest quotes possible. Don’t worry, it’s okay to say no and turn them down if you are not interested in any of their offers. You don’t have to commit to any of those contractors who contacted you just because they gave you free quotes. But since our service is free, why don’t you try it for yourself if you need a contractor to help you out with your wind damaged roof?